I’m sharing a hotel room with my cousin MV following this afternoon’s bridal shower for our great-niece and this evening’s dinner with great-niece’s grandfather. MV crawled into bed early, turned on the TV, and channel surfed, but could find nothing interesting. “I need someone to read me a story,” she said. Booting up the laptop, I located “The Definitive Summer 2012 Version” (so named to distinguish it from the other 3,243 Molly files) and crawled onto the queen-sized bed opposite hers. And I began to read. I had reached the last paragraph of page 11 when I heard snoring. Could this be, I thought, an omen? And if an omen, is it good or bad? I never stood on ceremonies, but–when your own blood kin, whom you’ve known for over half a century (wow! ), whose infants you fed and diapered and lugged around as if they were your favorite baby dolls, for whom you served as target for the all the slings and arrows of outrageous cousinhood she let fly–like the time she was visiting you and she got all wasp-stung picking Kentucky Wonder beans off Mr. Armentrout’s fence and went to bed with an ice pack on her hand and in the middle of the night she laid it on your mid-section just to see what you would do and you were only sixteen and she was thirty and old enough to know better–well, when your own blood kin can’t stay awake to see what happens at the end of chapter one, then you might do well to find something to take the place of novelizing. Like playing Bookworm for eight hours straight without guilt rather than with it. 1. MV liked the very first draft I wrote and keeps telling me I’ve ruined it and I need to toss all my (years of) revisions and bring back the original. It’s nowhere near publishable, but she liked it. 2. She laughed at all the right places, or most of them, while she was awake. 3. She’d had a long day and was tired. 4. She might have been motivated by revenge because I told her she was old. Which I’ve done several times on this trip. Like when she wanted to lift my suitcase onto the luggage rack for me. I mean, my doctor has referred to me as an “older person,”* but she’s been eligible for the senior citizen breakfast at IHOP for years. And just minutes ago, at midnight, she racked up another birthday. In short, it’s possible her untimely entry into the land of Nod is a non-ominous omen, having zilch to do with literary criticism, and therefore no reason to get my knickers in a twist. I’ll interpret it that way anyhow. About paragraph #9, above, MV woke up and walked to the refrigerator for a bottle of water. On the way back to bed, she noticed me sitting on the sofa where I am still parked, composing. “You’re not going to want to get up in the morning,” she said. “I never do,” I replied. She didn’t ask what I was doing, so I didn’t tell her I’m writing about her. I didn’t tell her about the photo I’d already chosen to illustrate this piece either. She’ll find out soon enough. She’ll also learn what happens to kinfolk who fall asleep during a dramatic reading of Kathy’s Perfectly Polished Prose. * But he did it only once. 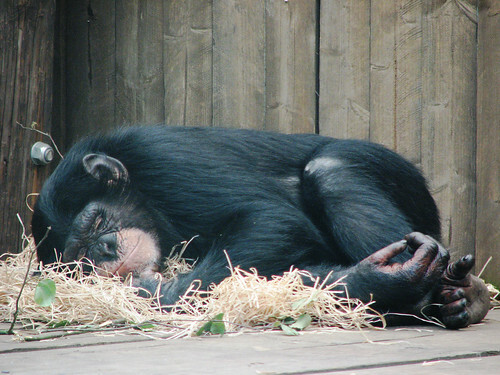 Photo of Snoozing Chimp by World of Oddy via Flickr (CC BY-NC-SA 2.0). LOL, Kathy. Let sleeping relatives lie! I often am tempted to get revenge on people in my life in my blog. My sister doesn’t own a computer, but the rest of the family is computer savvy so, it curbs my temptations. This blog will cure her of falling asleep during your manuscript! Thanks for the laugh. Kathy, laughed out loud with this one! You are indeed skilled–particularly at writing satire! Love love love it! I love your sense of humor, Kathy! Note to self: never share a hotel room with Kathy. I think I’m with Linda on this one. Kathy, have you thought of the fact that you probably just have a beautiful, sonorous, restful voice? Or, perhaps, a monotone: It may not be the material at all, but the delivery? Kathy, I routinely read my sweet spouse to sleep (except on car trips, when he drives and I read…to keep him awake). It’s your soothing, restful voice, trust me! And all your readers stayed awake long enough to post comments, so there you are then. Proveszzzzzz…. Hilarious! Especially having been with family all weekend. And I admit to all of the above…still have the first and second drafts, and they are the BEST, I dont care who critic’s your work. So there ! Such a fun post! Happy birthday to your cousin. Kathy, life is full and not particularly nice, and then I come along here seven days after I ought to have done and I read this and I just feel good. It is so funny, and it made me laugh. Thank you. 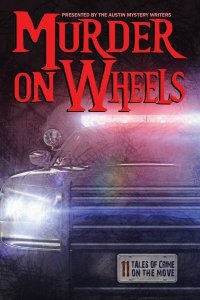 You are a fantastic writer, and one day you will be published so that complete strangers can fall asleep dreaming of Molly.